Our accommodations were surprisingly good. We stayed at the office complex for World Relief Hope, a ministry that works with elementary school kids in the outlying areas of Phnom Penh. Staying at this facility with us were 2 young ladies and 7 young men (in their early twenties) who were being trained daily to do the outreach of this ministry. Two of them could speak very limited English. In spite of the language barrier, we developed a very mutual loving relationship with these winsome young people. The facility was actually a modern 6 bedroom, cement and brick, house, similar to hundreds of others, either already built, or in various stages of construction, all around the city. The total rent on the whole place was $600 per month. There were a surprising number of Cambodians who had found a way to live at this luxurious level (by Cambodian standards). Several days after our arrival, we were invited, on very short notice, to attend a traditional dance presentation, out in the countryside, put on by some Khmer school children ages 6-20. As it turned out these children attended the same schools that some orphanage kids attended. 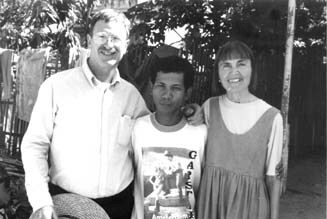 These orphans were part of a Cambodian Christian Orphanage that some of our western friends in Phnom Penh have a loose connection to. As we traveled out into the country and left the main road, it wasn't long before the variety of structures around PP were getting sparser and sparser until there were sometimes blocks of beautiful green fields separating the few buildings. We finally came to the site of the dance presentation. It was a building slightly larger than a portable classroom; much taller inside, all made of wood, with no electricity or bathrooms (unless you count the trees outside). The only light was that which streamed through the openings on either side of the structure or that which came from the flashes of the tourist's cameras. As the program began, the skill of the dancers, and the intricate beauty of their many different costumes stunned us. There must have been 10 or more dances, some humorous, some sober, some with all the same gender, others mixed, but all seemed to tell a story from the past history of Cambodia. Nancy and I are quite partial to young children and as we watched in the dimly lit room, a most amazing thing happened. 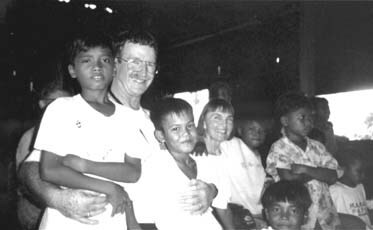 Young children, whom we later learned were the orphans, crept up beside us until they were literally leaning against us. They needed very little encouragement to slide up into our laps. Let me tell you this "surrogate" grandpa was in seventh heaven. In spite of their unkempt appearance, they were the most beautiful children in the world. When it came time to leave they would hardly let us get into our car. We later learned that their lack of inhibitions was the product of much western tourist attention at their orphanage. The typical kids that we met on the streets of PP were not as affectionate, but just their curiosity would sometimes cause them to approach us and grab the hair on my arms (an anomaly in Cambodia), or hold our hands. We found the children of the squatter's village, on the banks of the river, to be the most likely to exhibit this behavior. In the movie, The Killing Fields, the two main characters are Sidney, the American journalist, and his translator, driver, etc., who also becomes his very close friend, Dith Prahn. On one of our first forays out into PP, we ended up hiring a moto driver by the name of Siphan Lok, or in Cambodian order, Lok Siphan, affectionately referred to by us from then on as Loksi. He was one of the few drivers we met who could speak passable English. We were so taken by his humility and attractive personality that we asked him if he would like to become our permanent driver. 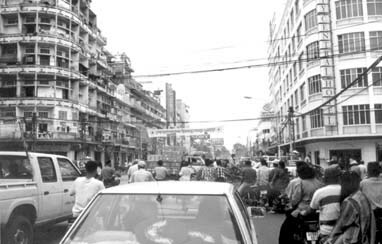 His first assignment was to take us to the infamous Toul Sleng museum, in the heart of PP, the site of the imprisonment and torture of many of the Cambodians slated for the death pits just outside the city. As we arrived there and discovered that there were no tour guides, we asked Loksi if he would be willing to serve as our guide. Even though he had been through the place before, he seemed reluctant to accept our request, but finally agreed to take us through. We entered building after building showing places where the prisoners were shackled together, side by side, by hands and feet, on their backs, to spend the entire night unable to roll over, or relieve themselves. Other rooms given over to the torturing of men, women and teenagers, to try and obtain proof that this one or that was a teacher or a Dr. etc. Increasingly, it was obvious that Loksi was uncomfortable being in that place until we finally saw that he had begun weeping. Nancy was so moved by his weeping that she was overcome and began to weep, as well. When asked about his grief, he shared that, while none of his relatives were victims of Toul Sleng, his mother and father had been put to death by the Khmer Rouge out in the country. General memories of that time, though twenty years past, were still very painful to him. Something happened in that shared moment of grief and empathy that would forever link our hearts. Loksi became more than a moto driver to us that day, he became our adopted son, our Dith Prahn. In the 4 short weeks to follow we would grow as close as the time and language differences would allow. What a special day it was when we talked him into taking us out to his house and letting us meet his wife and two boys. At first, we couldn't understand his reluctance, but learned that he was afraid that we would make fun of his humble habitat. On the way out there, he insisted on stopping at a roadside stand, in order to buy bottled water for us to drink when we got there. Knowing that those bottles of water would cost him a good portion of his wages as a moto driver for that day made us urge him not to spend the money, but he insisted. He and his family shared a small, three room, raised, wooden house, with his brother and family. As we arrived you would have thought we were royalty. The neighborhood warmly greeted us. The catering to westerners that we received in many places was very difficult for us to accept. How special it was to meet his shy, kind wife, and rambunctious children. Another special memory was the time we convinced him to bring Sinan and the boys into "the city" for a shopping spree and lunch, on us. He could barely bring himself to accept our offer of generosity. We gave each of the boys (ages 4 and 5) $5.00 to spend any way they wanted and for Sinan, $10.00. I had already given Loksi my watch as his gift. I get teary-eyed thinking about the joy that simple act brought that family. The boys used part of their windfall to purchase toy guns, the kind that make all kinds of electronic noises. Sinan used part of hers to buy a straw hat with flowers on it. We all ate lunch at a favorite Cambodian restaurant for about $7.00; sodas included (which the boys had never tasted). In all subsequent correspondence Loksi continually reminds us that the boys ask about their grandparents, and he now refers to us as mom and dad. We went to give ourselves away; we came back with more than we ever gave.